The Boston Bruins followed up a humiliating 7-0 season-opening loss to the Washington Capitals by reeling off four consecutive victories. Last week’s swing through Western Canada, however, saw them drop three games to the Calgary Flames, Edmonton Oilers and Vancouver Canucks, including a pair in overtime. Injuries to defensemen Charie McAvoy and Kevan Miller and forward David Backes contributed to those defeats. Another is their ongoing inability to find a suitable third-line center. That role was filled previously by Riley Nash, who enjoyed a career-high 41-point performance in 2017-18. Nash departed for the Columbus Blue Jackets last summer as a free agent and he’s proven difficult to replace. As the Bruins were winding their way through Western Canada last week, TSN’s Darren Dreger reported the B’s could be in the market for an experienced forward, preferably a center. He suggested a youngster like Danton Heinen or Anders Bjork might interest clubs looking to swap out an experienced forward for a younger, inexpensive one. Dreger didn’t indicate which teams the Bruins should target. One option could be the retooling New York Rangers. The two clubs have a recent trade history and Rangers center Kevin Hayes is slated to become an unrestricted free agent in July, not to mention is a Boston native who attended Boston College. A couple of Boston pundits, meanwhile, feel the Bruins should pursue a higher-profile trade target. The Boston Globe’s Kevin Paul Dupont and NBC Sports’ Joe Haggerty suggest Columbus Blue Jackets left wing Artemi Panarin as a good fit alongside second-line center David Krejci. Panarin, 26, won’t address the Bruins need for a third-line center, but he would bring a significant boost to their second line. He tallied a career-best 82 points in 2017-18 and is on a similar pace with nine points in seven games early in this season. An unrestricted free agent next summer, Panarin is reportedly reluctant to sign a contract extension with the Jackets. That’s prompted speculation he could be shopped at some point this season. Haggerty proposed pitching the Blue Jackets a package of Heinen and puck-moving blueliner Torey Krug. Dupont believed the Blue Jackets asking price could be higher — McAvoy and DeBrusk, though that could be worth it to land “a generational talent” such as Panarin, assuming Boston could get him to sign an extension. By all accounts, Jackets general manager Jarmo Kekalainen has no plans to move Panarin. As long as his club remains in playoff contention, it’s assumed he’ll retain the talented winger for the remainder of the season. Though unlikely, should the Jackets fall out of the postseason chase by January, Kekalainen could attempt to peddle Panarin to the highest bidder. However, being unwilling to sign a contract extension will adversely affect his value in the trade market. Rival GMs won’t want to part with a big return for a playoff rental player. 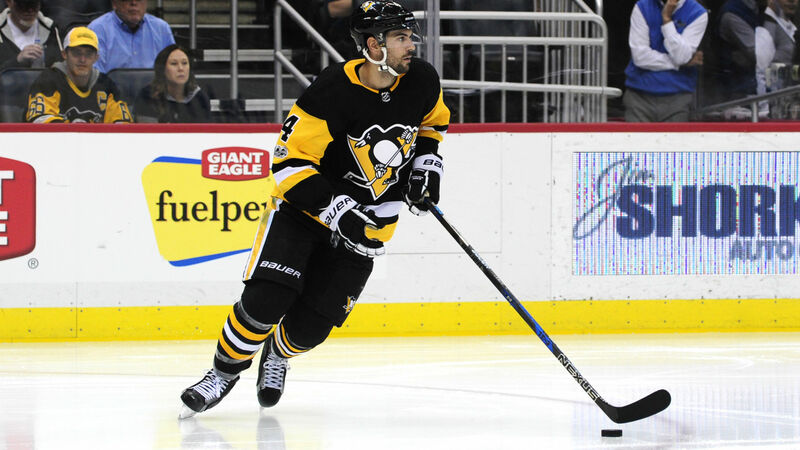 Last Monday, the Pittsburgh Penguins announced defenseman Justin Schultz is out four months following surgery to repair a fractured left leg suffered against the Montreal Canadiens. It’s a significant blow to the Penguins blueline corps. The 28-year-old Schultz is a skilled mobile rearguard and a solid presence on their second defense pairing. The Pittsburgh Post-Gazette’s Jason Mackey reported Penguins GM Jim Rutherford doesn’t intend to seek a short-term replacement for Schultz via the trade market, preferring instead to look to within. However, Rutherford acknowledged he might consider “other options” if the club failed to perform as hoped in Schultz’s absence. Since taking over as Penguins GM in 2014, Rutherford has proven willing to make early-season moves to bolster his lineup. Penguins forward Riley Sheahan was acquired last October from Detroit, while blueliner Jamie Oleksiak was obtained from Dallas last December, to fill holes on the roster. Schultz’s injury could prove a silver lining for Penguins blueliner Olli Maatta. His poor start this season saw him banished to coach Mike Sullivan’s doghouse. Sportsnet’s Elliotte Friedman speculated Maatta himself could be on the block. Like Schultz, Maatta entered this season considered a valuable part of the Penguins’ defense corps. Should his early-season struggles continue, it could cast some doubt over his future in Pittsburgh once Schultz returns to action.